MoreRichard Bone has been specializing in personal injury and wrongful death cases since graduating from Detroit College of Law in 1968. Richard is admitted to practice in all of the Michigan State Courts, Federal Courts - United States District Court for the Eastern District of Michigan and United States District Court for the Western District of Michigan. With over thirty-five years of trial experience, Richard has taken over 100 cases to trial. 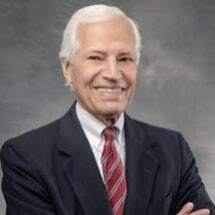 Richard has extensive experience in pursuing...Richard Bone has been specializing in personal injury and wrongful death cases since graduating from Detroit College of Law in 1968. Richard is admitted to practice in all of the Michigan State Courts, Federal Courts - United States District Court for the Eastern District of Michigan and United States District Court for the Western District of Michigan. With over thirty-five years of trial experience, Richard has taken over 100 cases to trial. Richard has extensive experience in pursuing and defending medical malpractice, auto negligence and other types of serious injury and death cases. Richard has successfully handled very severe injury and death cases, achieving multi-million dollar verdicts for his clients. Richard has been selected a Super Lawyer in the area of plaintiff personal injury. Richard and his family are lifelong Michigan residents.